If you don't see your question listed below, please feel free to contact us. Does Come, Sit, Stay offer complimentary consultations? Yes, we provide a complimentary consultation at the beginning of each new client partnership. Where will the consultation be held? 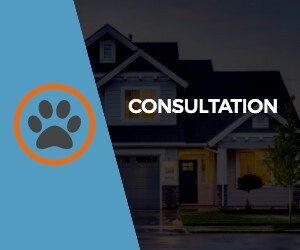 Consultations are held at the client's residence. This allows us to meet your pet in the environment where we will be working with him or her. Also, to see where pet care related supplies are kept. Do I, the client, need to have anything ready for the consultation? Yes. Please be prepared to discuss your pet's needs, routines, and health history. Also, please have a home entry method ready to provide a team member during the consultation. 15, 30, 45, and 60 minute services can be canceled up to 9AM the day of the scheduled service without incurring the standard service charge. See our policies page to learn more. Do you work with clients whose needs change week to week? Yes! Many of our clients have needs that change week to week, month to month, or season to season. Do Come, Sit, Stay employees undergo background checks? Yes, all CSS employees have had both professional references checked and a criminal background check. Will I work with the same CSS team member for all my services? Each team member focuses on a specific geographical area within our service area. As a result, most clients have a primary care partner that provides the majority of their services. Weekend service needs, employee time off, short notice needs, and a broad range in service needs often result in occasions where a client may not work with their primary partner. Do you accept last minute requests? Yes! We always recommend giving us a call or email as we will do our best to accomodate your request. We will always clearly communicate if we are or aren't able to meet your need. Is there a charge for services on the weekend? We do not charge an elevated rate for weekend services. Our only service surcharge is for services provided on holidays. You can see our full holiday policy at the top of our policies page. Does Come, Sit, Stay offer daycare and boarding services? We do not have a boarding facility and do not take pets into our homes. We do offer an in-home overnight service in the client's home. Learn more on our dedicated overnight service page. Do you work with other animals other than dogs? Yes, we enjoy working with all types of household pets. To date we have worked with dogs, cats, rabbits, guinea pigs, hamsters, rats, parrots, chinchillas, ferrets, fish, and chickens. Please see our service area page to see a larger map of our service territory. Our office is staffed Monday through Friday from 8AM to 5 PM. We offer services in the field 365 days a year, typically between the hours of 8AM and 8PM. Our overnight services vary based on client need, but extend from approximately 5 PM until 8AM the following day. We accept cash, personal check, bill pay check, bank transfer, debit card, and credit card payments.